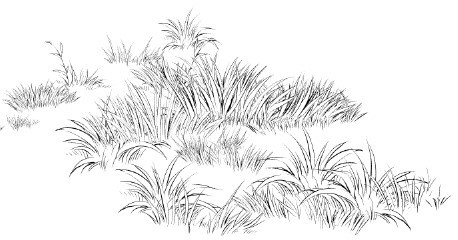 The brush materials of Clip Studio Paint is an essential tool to draw natural objects and effects more quickly. However, the style of drawing are various. and it might not fit your own style when you use it. 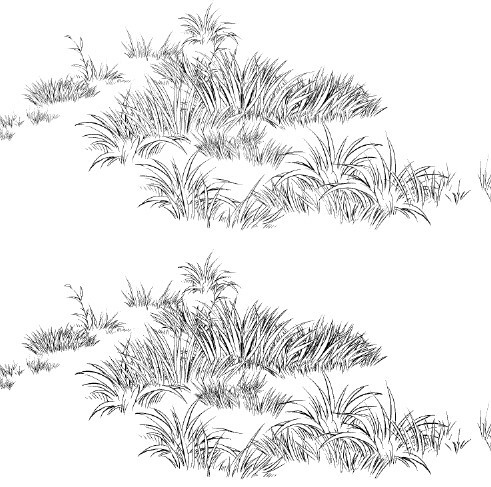 we will introduce various line width correction methods of brush materials. but also to background materials and 3D materials. ※The size’s number that using here are millimeter (not pixel). This section introduces the easiest correction method. If you are not strict to line quality, it is enough to learn this section only. 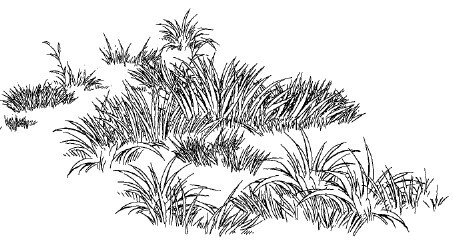 Most of the brush material contains a white background like below. This white background is very effective for improving work efficiency. but at the same time it is better to keep this white background. It is easy to solve these at the same time. You can duplicate the layer and edit the duplicated layer. Once we hide the original layer then edit the duplicated layer. the white background will disappear and only line drawing will be left . I will further edit line drawings. Choose “Blur → Gaussian blur” from the Filter tab. 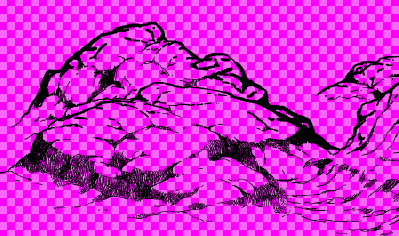 The higher the value of area to blur, the thicker the line later become. Here, set the minimum value of 2.00 and press the OK button. 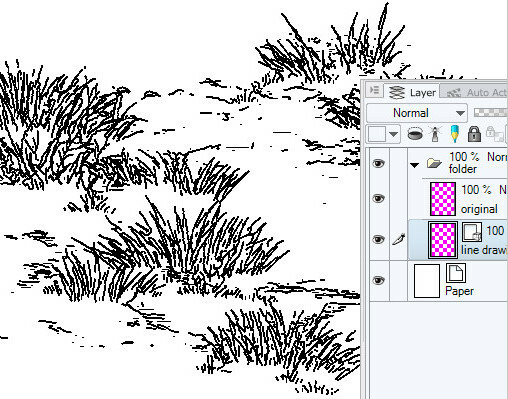 Next, change the Expression color of the blurred line drawing to monochrome from the Layer Property section. Do not worry when the appearance become disappointing. Adjust the item with alpha threshold from here. Lower the value of Alpha threshold. The lower it goes, the thicker it becomes. Increasing the value will narrow the line. 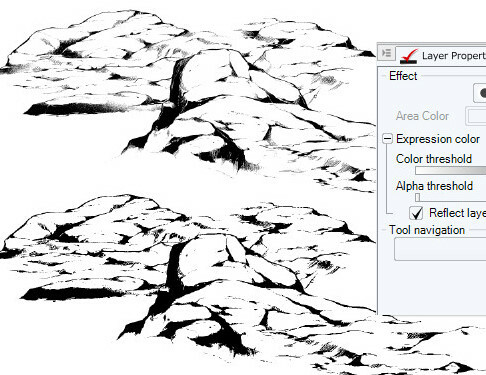 you can easily change the linewidth and impression of the brush material. 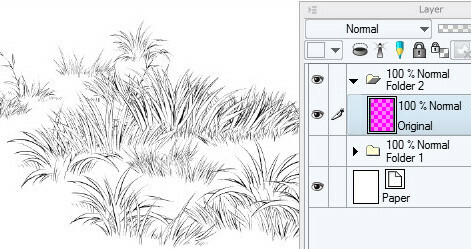 (Press “Ctrl + left click” on the original layer to take the selection area) and fill it with white then OK.
Once the correction is completed, combine the line drawing with the white background then the work is completed. Print and check it if you are concerned about the finish. In this step,We will correct only the outline of the brush material. The thickness of the outline changes the impression of drawing. First of all this is the easiest way. 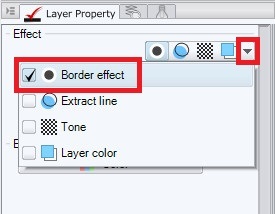 Check the Border Effect box from the pull down of the layer property window. Change the edge color to black and adjust the thickness of the edges. Adjusting the thickness of the edges allows you to freely change the width of the outline. while keeping a white background. 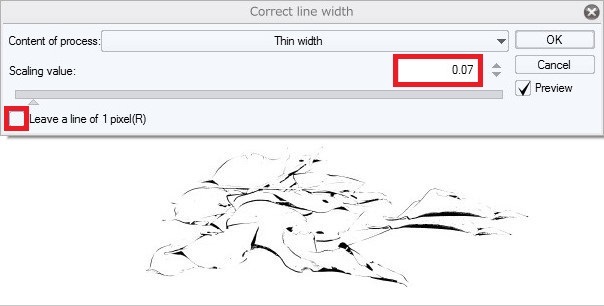 Next, is a method that using “Correct line width” function. 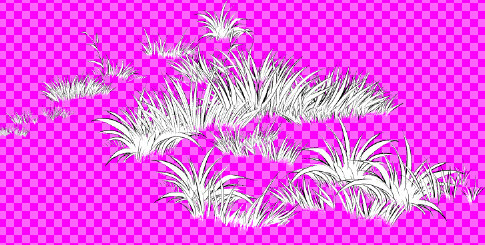 Here as well, we will edit the brush material which containing the white background. 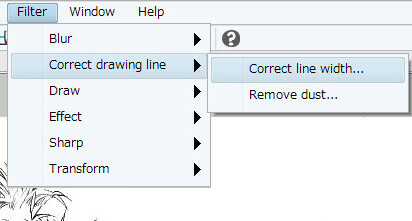 From the “Filter” tab select “Correct drawing line” → “Correct line width”. Select “Thicken width” with desired value and press OK button to complete. As you can see, if you modify the line width with an object with white background, only the outline becomes thick, which is very easy. Partial correction is also possible if you enclose a specific place in the selection area. 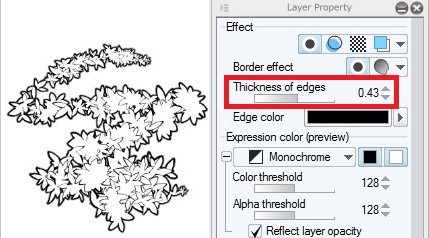 If you want to fine adjust the thickness of the outline, use the vector layer. 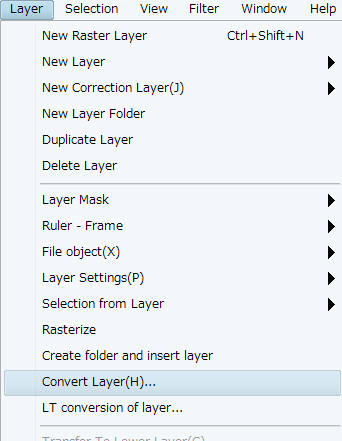 Right-click on the corresponding layer, or select Convert Layer from the Layer tab. Select “Vector layer” from the pull down. 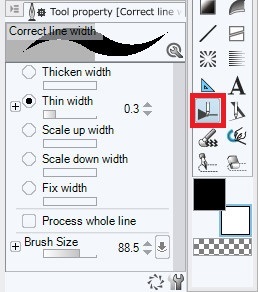 When you convert a drawing with white background into a vector layer, the white background automatically disappears. 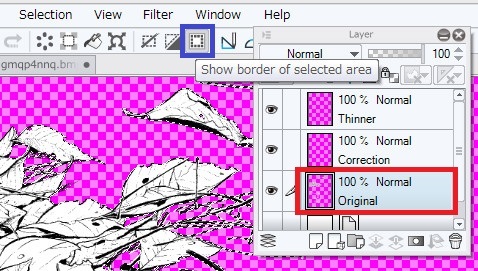 To leave a white background, tick the box to Keep original layer and press the OK. 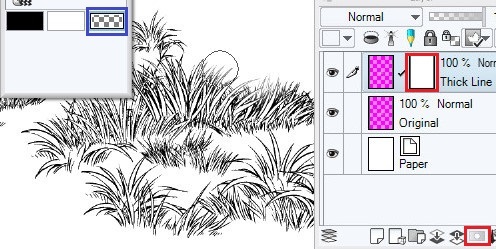 When conversion is completed, rearrange the original layer with white background up and the vector layer of the line drawing down. so the thickened line stand out from the back of the white background. and you can freely change the line width of the outline for each part to be corrected. It becomes like this material with a simple outline. 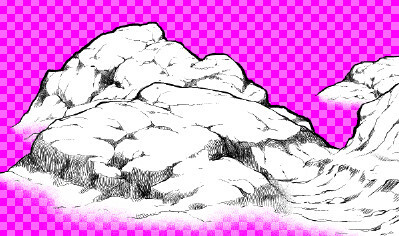 View of hidden original layer with white background. with cute or strong impression. it will turn into a more user-friendly brush. Secondary distribution of processing material becomes copyright violation. 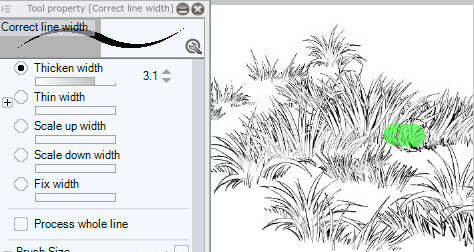 ・Vector layers’ order is 「white」 above, 「thick line drawing」 below. In this step, we will tell you how to widen the line width of the whole line. The easiest way is to convert it to a vector layer. First, prepare the original material. 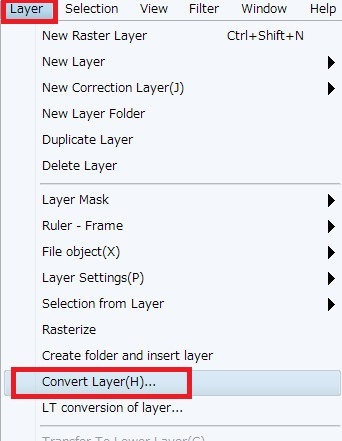 “Right-click” on the layer, or select “Layer” from tab → “Convert Layer”. the white background automatically disappears. 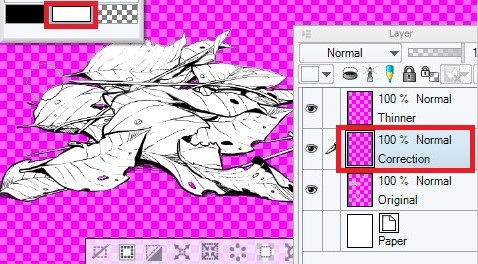 To leave a white background, tick the box to keep the original layer and press the OK button. 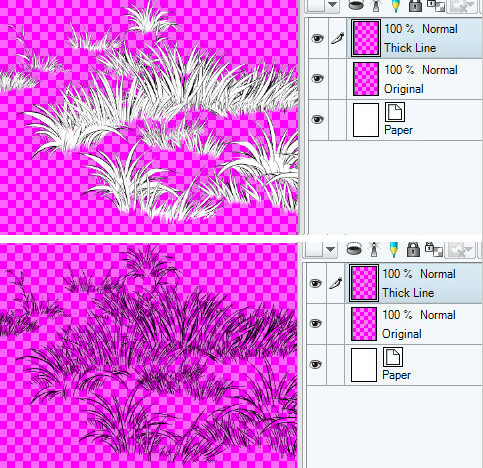 Converting to vector layer will automatically make the line drawing thick, so the work is complete. However, there are two problems with this method. One is that the convert line drawing into a vector layer is very inorganic and mechanical. The other is that the conversion precision will change depending on the size. The figure below shows the page of size B4 zoomed out. the brush stamp inside red frame is a smaller size. Let’s convert smaller size of material to vector layer. It became a miserable form that does not keep the original form. Even if you try hard on this, it will not be usable. So I will introduce another method. 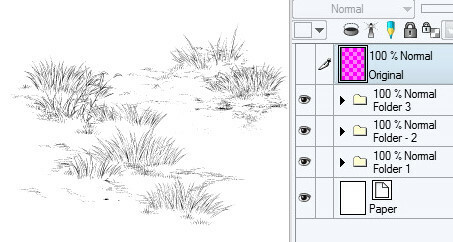 Duplicate the layer of the original brush stamp. From the “Edit” tab, choose “Convert brightness to opacity”. 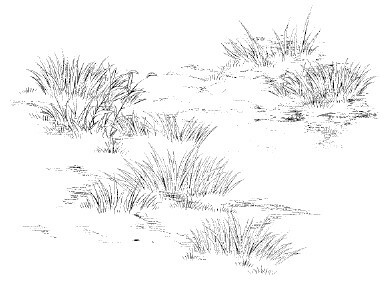 The white background disappeared, and only the line drawing is showing. Press “Ctrl + E” or from “Layer” tab select Merge with layer below. The upper part is “original layer” . 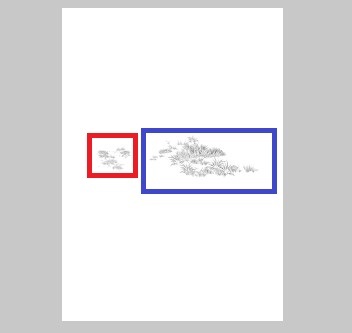 Below is a state where “original layer” and “line drawing” are merged. You can see that the line is slightly thicker. Next time I will try duplicating a lot of line drawings. Unlike vector conversion, the overall line width became thicker. But there is a trap here, so be careful. 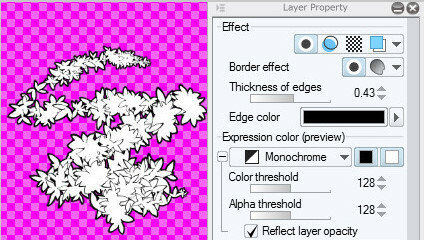 Merging the duplicated layers will make the lines thinner. Even if it is thick on the screen, it will not be reflected in the printed result. The Merged lines become lines of the correct thickness. And the line width change is up to 4 to 5 copies. No changes can be seen no matter how many times it is duplicated. Below is a comparison of “Original Image”, “One Merged Duplication”, “Five Merged Duplicate” comparisons. It is gentle but you can see that the line is thick. And I will try the same method for the small size as before. the line became thick with natural impression. 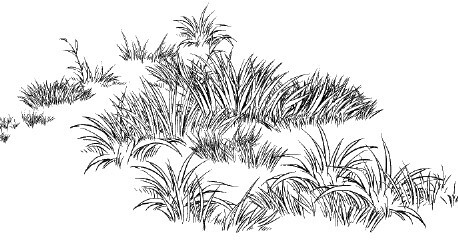 Depending on the brush, some lines may become considerably thinner as the size is reduced. This correction method is a small skill that can be used at such time. In such a case the most quickest way is still the vector layer. First, prepare the original material (Brush stamp). 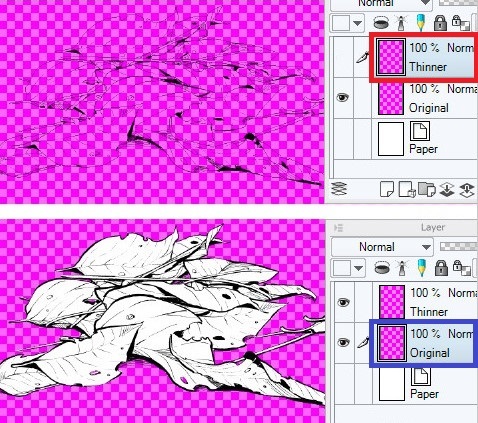 select “Convert layer” → Vector Layer. the white background will disappear automatically. tick the box to Keep the original layer and press the OK button. 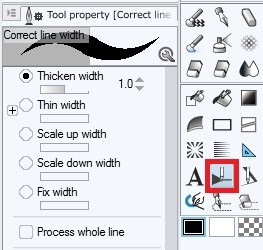 You can freely change the line width of the partial line. there is a weak point that accuracy drops remarkably. So we will practice a method by not using the vector layer. Prepare the original layer and thick lines corrected drawings. With the two pieces perfectly overlapped, the line drawing is placed on the original layer. ※Thick line drawing on the top. Original drawing and white background on the bottom. 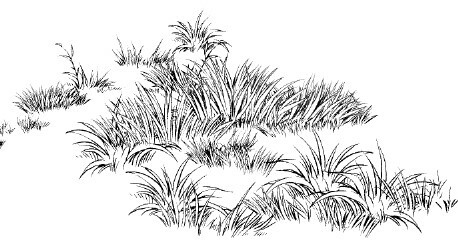 Using a tone scrapping brush or airbrush, scrape the Thick line drawing with transparent color. The thin line drawing on the bottom appeared and partial correction is done. Using a “layer mask” (red frame) is useful for correction and redoing. 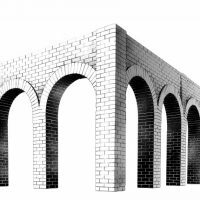 This method can also apply on existing background material and 3D rendering. Please check with the print check of the finish. 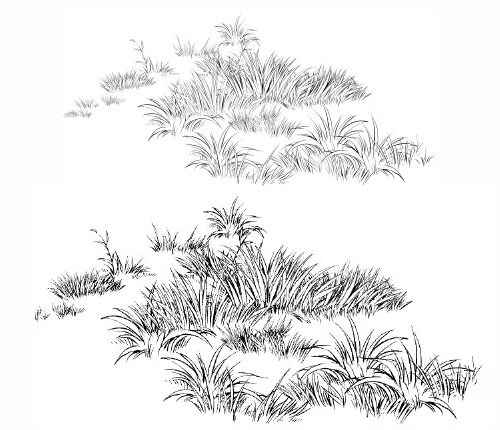 ・ Duplicate two line drawings layer with different thickness, and cut thick line. In this section we will show you how to thin the line of the whole material. First prepare the original layer (Brush stamp). Then choose “Thin width” and adjust the numerical value. The higher the value, the thinner the line width. You can check the change by checking the preview box. Let’s set it to your preference and press OK. 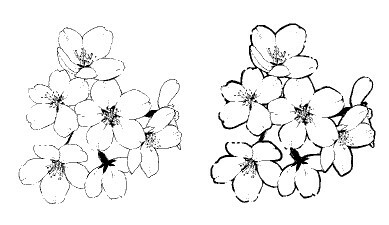 The upper is the corrected (value 0.3), the lower is the original image before correction. The impression has changed considerably. The line width is corrected only for the outline. Next is to thin the overall line width. Duplicate the original layer by right-click on the layer. Choose “Convert brightness to opacity, from the “Edit” tab “. 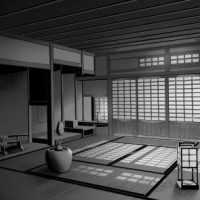 The white background disappeared, and only the line drawing left. ※Please hide the original layer at this time by click “Eye mark”. ※The white background of the brush materials increase work efficiency in all aspects. We recommend editing after duplication, to leave a white background. Hide the original layer that contained the white background then edit duplicated layer. 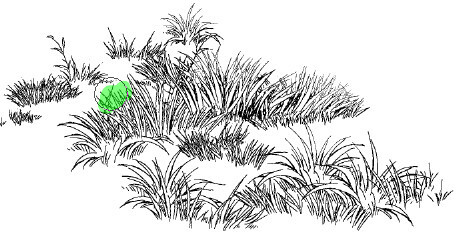 then uncheck the box to leave a line of 1 pixel line. and it became the shadow. Partial correction is also possible if you enclose a specific place in the selection range. An example of checking box that Leave a line 1 pixel. It becames a very delicate impression. In this way the line drawing of the original layer becomes an obstacle. 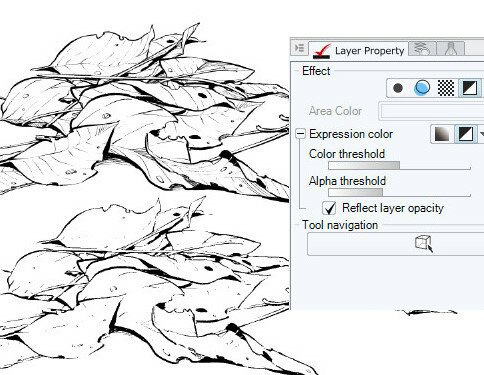 Hold down “Ctrl” and click on the original layer to take the selection area. Complete a solid white background by filling with white. Now, the line correction is completed while leaving the white background. In this section we will tell you how to correct partial line. The most quickest is still the vector layer. tick the box to keep the original layer and press the OK. 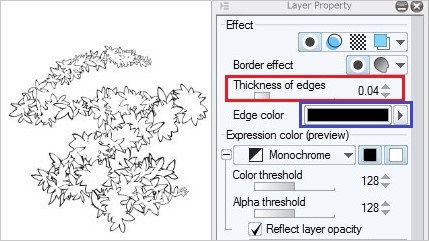 Since the line drawing of the original layer is an obstacle, erase it unless necessary. 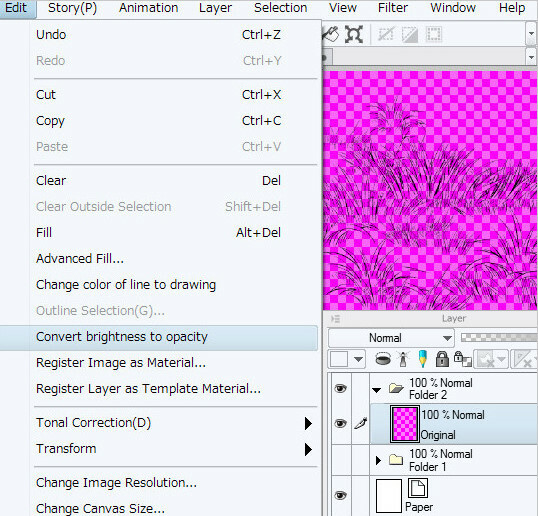 Hold down “Ctrl and click” on the original layer to take the selection area. Filled with white, it is completion of solid white background. So we will try a method by not using the vector layer. Thin line drawing and white background on the bottom. 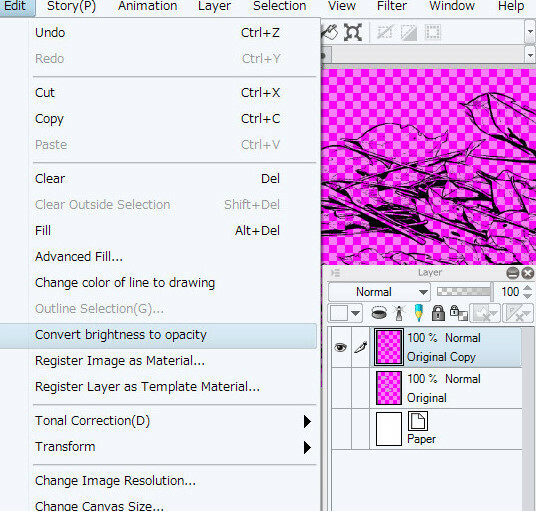 Hold down Ctrl and click on the original layer to take the selection area. Next, press the button (inside the blue frame) of Show border of selected area. 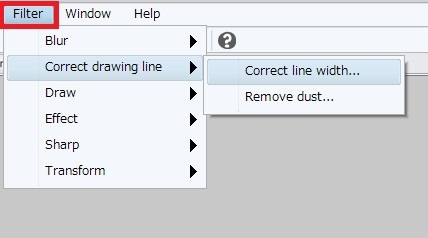 This will hide the border of the selected area, make editing of the line drawing easier. Assuming redoing, we will create a new correction layer and work on it. 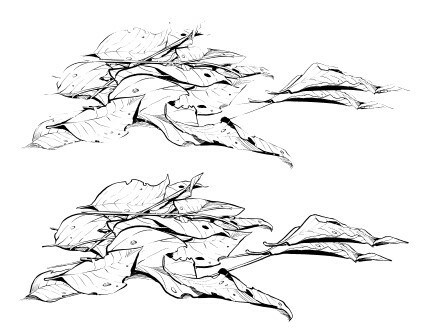 Using the scraping brush or airbrush, scrape the original line drawing with white. The thick line drawing disappeared, and partial correction is done. The top is corrected, bottom is the original image before correction.